Published by Cyril Huze November 28th, 2007	in Builders, Editorial and Merchandise. Clymer(R), publisher of the leading family of do-it-yourself repair manuals, announced the addition of its all-new Harley-Davidson VRSC Series 2002-2007 Manual to its extensive line of motorcycle repair manuals. 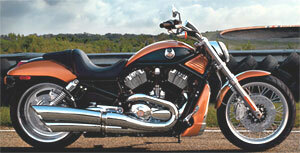 Clymer motorcycle repair manuals provide step-by-step procedures based upon complete disassembly of the motorcycle. This hands-on experience, combined with extensive research, results in a manual that is both detailed and user-friendly. Hundreds of original photos and illustrations guide the reader through every job, simplifying repairs and reducing repair costs. This manual includes the following chapters: general information; troubleshooting; lubrication; maintenance and tune-up; engine; clutch; transmission; shift mechanisms; fuel, exhaust and emissions systems; cooling system; electrical system; wheels, hubs and tires; front suspension and steering; rear suspension; brakes; and body and frame. In addition, the manual includes color-wiring diagrams for all models; a quick reference section with frequently used specifications on specially marked pages; and a comprehensive table of contents and index to find information quickly. For additional information, visit Clymer Website. I have several Clymer manuals, and they are much better and of course much more complete than the HD manuals. A must if you really work/customize a Harley. Not in their website, yet. Call them to order.